As a club team road.cc are no strangers to 24hr relay races and we are about to use all of that hard earned knowledge and experience to take on revolve24, an event that takes over the grounds of the Kent racing circuit Brands Hatch for a weekend in September. We've been there before, twice in fact but we keep going back for more sleep deprivation, the undulating track and those hypothermia inducing pit garages because....well it's fun! revolve24 kicked off in 2015 and we were there with a team of six made up of road.cc staff and some of our readers, it was an absolute blast especially once we realised we were quite competitive. Going back in 2016 we could see how big the event had grown over the twelve months with the pit garages being much busier than before and the track not being quite so lonely, especially in the darkness when there were loads more lights breaking the darkness ahead of you. Oh yeah, we got all competitive again too, well it's hard not to! Now a qualifying event for the 2018 RAAM (Race Across America) and there is also a revolve24 in Australia for next year thanks to it association with the Santos Tour Down Under pro race. It'll be based at The Bend Motorsport Park in Adelaide on January 13th & 14th. You can find the full details here. As you've probably guessed by the name, revolve24 sees you lap the track continuously for 24hrs, whether that is on your own (mental), in pairs (slightly unhinged), a group of four (borderline sanity issues), team of six (cosy) or a squad of eight (lazy) - road.cc are taking the latter! You start at 3pm on the Saturday afternoon with a Le Mans style race across the track to your bike, purely for no other reason than the organiser's obviously think a load of roadies waddling across the track in cleats will create an awesome montage to the Benny Hill theme tune. That's it really in a nutshell until 3pm on the Sunday, round and round you go with one team member on the track at any one time, well unless you're working alone and you've got to factor in some downtime. A lot of tactics come in to play in those 24hrs though mind especially if the weather is changeable with a lot of the time off the bike is being more stressful than when you are on it as you watch the live chip timed results constantly change in front of you. If spending an entire day circumnavigating the track isn't your thing there are plenty of other options, a 12 hour Dusk til Dawn challenge maybe. This runs on a similar vein to the main event but starts at 7:30pm on the Saturday evening running through to the same time Sunday morning. Still too long for you? If so you're more likely suited to the 6hr event that runs on the Sunday morning from 9am through to 3pm, this is only for solos or duos though so you are still in for a pretty tough day and with fresh legs you'll be fair game for the 24hr riders to hunt down and latch onto as they claw themselves around those final few laps. For 2017 there are also a couple of new events like the 2-up and 4-up time trials which take place on the Saturday morning before the main event kicks off so you'll have plenty of spectators. There will be categories for men and women's teams plus mixed setups. If tarmac isn't your thing then there is also the Gravel-X Sportive, The Brands Stormer which meanders around inside the track area before heading out into the Kent lanes for a total of 62km. There is certainly plenty to do and you can find all of the entry fees and details here on the revolve24 page. It ain't flat! That's the easiest way to put it, you are either climbing or descending on various gradients with my speed last year maxxing out at 50mph on some sections while others you're struggling to get above double figures . From what I remember as well the tarmac feels super grippy so you aren't going to be getting anything for free but it's pretty well sheltered so the wind shouldn't be a major issue. To get a better idea why not take a look at Niall Warne's video here of a single lap . ​The highlight of the track is the pit straight, after the lumpiness and false flats of the back section you slowly start to build up momentum before you hit the cambered start/finish line before getting dumped into the dip of the descent after the first corner. It's certainly a rush but push to hard and you'll pay for it on the climb. ​Now most of us have seen the British Touring Cars or Superbikes hurtling around Brand's Hatch but it's worth remembering that we aren't carrying the same amount of speed on our double diamond machines so we really don't need to take the 'racing line'. Graham Hill bend is the only one where you can mess things up, for the other bends take the easiest, less steep part of the corner. The fastest lap of the track on Strava is 5 mins 27 secs plus there is also a KOTH (King of the Hill) prize for the climb up to Druids, the steepest part of the track. 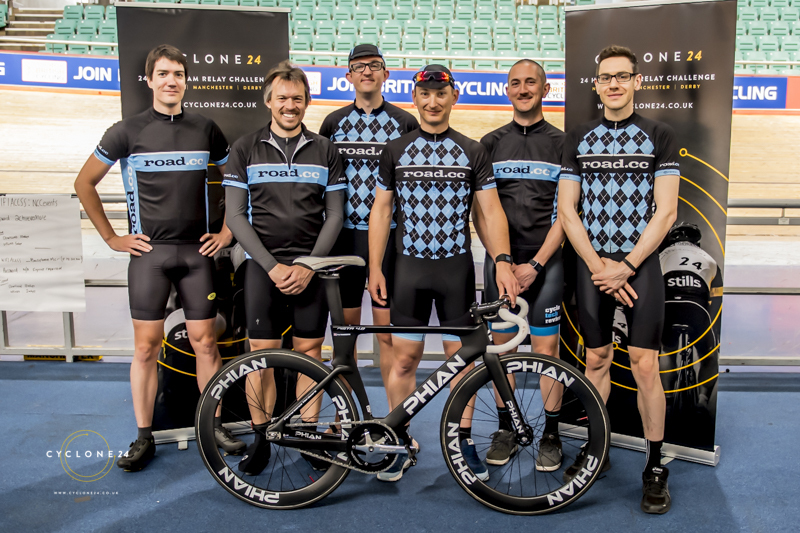 Track master and Olympian Jason Kenny took that in a time of 10.08 seconds, our quickest rider last year was Stu Kerton in 20th position with 14.38 seconds so we'll see if this years squad can top that. Jason will be riding the event again this year along with his father-in-law raising money for the RNLI, it's not often you get to race alongside an Olympic gold medallist. revolve24 have been generous enough to give us a team place so we thought it'd be great to pass on the good vibes by raising money for one of the chosen charities, Cancer Research UK. Somewhere along the lines most of us have been touched by this terrible disease and this is why we'd love to be able to hit our target of £1250 before the race starts. The team have a justgiving page set up and if you could make a donation it'd be massively appreciated by the riders and CRUK. This is home for, well considering your setup time and the like probably 32 hours so you need to bring some creature comforts. A painted concrete shell isn't the most accommodating place especially at 3am on a clear autumnal evening with temperatures dipping into single figures . One of our team brought a four bar electric heater last year and what a godsend it was, even more so if things are wet. Due to the amount of teams taking part you're likely to share a pit garage which is great because you get to watch tactics and the various states your competitors are in you really do get to see some sites with some riders looking like mere shells of a human being. It does bring a great sense of camaraderie to the whole event as you find yourself helping others, especially the soloists with the simplest of tasks but it makes a massive difference to them. We've made a good many friends over the last couple of years. There is coffee and refreshments on offer throughout the event in one of the garages plus mechanical assistance, revolve24 is one of those places that never sleeps. As a team of eight road.cc will most likely sticking to last years formula of thirty minute stints out on the track as that seemed to work well. The previous year we tried a full hour each but performance really started to drop off around the fourty-five minute mark before we tweaked the format. Everyone reacts differently to the effort and lack of sleep so it really is a matter of making a lot of decisions on the fly to make sure everyone is working at their best plus this year we will actually have a team manager/brew maker/broom pusher who will be watching from the sidelines to make the choices rather than knackered riders who see each other between power naps in cold tents, or in the corner under a pile of coats. We've come second and third in our respective categories before so although we are there to have fun don't go thinking we won't be turning up without a bucketful of competitiveness on board. Our team for 2017 is made up of members from our club, team road.cc and this is one of the benefits of being signed up - did you know it's free to join? We placed an announcement in the members section of the road.cc site for volunteers and what you see below is a selection of riders who have raced the event before and a few newbies. A real spectrum of riders from our readership and hopefully one that is going to gel rather than throttle each other if the coffee runs out at 4am. "A cracking weekend away with a great bunch of chaps. My crowning moment was getting the eleventh fastest lap of the weekend, even if it was more by chance than by power, as I hung on for dear life to the wheels of some whippets on the first couple of excited laps." "What I lose in ability I try to make up for in enthusiasm. I mostly ride with the formidable Royal Leamington Spa Cycling Club most weekends and occasionally use the short hop to work in fair weather to commute. In the main I struggle to get the daylight rides in. So it's regular roller sessions in the winter with the club and late night box-set catch-up roller sessions at home to tick the legs over." Rick is one of the chaps who has never had the er....... pleasure of riding revolve24 so we are looking forward to breaking him in gently. It'll be fun Rick, we promise! "I'm your average 47 year old cycling nut been a member of team road.cc pretty much since its start. I love cycling (gets me out from the kids, lol) and also building carbon fibre racing bikes, my bike is self built. I'm doing revolve24 because I'm a nutter, no seriously I love a good challenge and this just adds to the other events I'm doing this year. I've looked at doing revolve24 for the last 2 years but never got the courage to try it so when this opportunity with road.cc came up and I jumped at the chance." That's him at the front, a bit of a chef on the quiet Charlie certainly made life in the pits a damn sight more bearable in 2016 with a homemade cassoulet simmering away on a camping stove and plenty of cake. With a monster commute he is really getting the miles in in preparation for the hills of Brands Hatch, he topped the Strava club with just under 300 miles last week. "I moved to Bath for my first job, not because it was close but because 20 Cotswold miles makes for a beautiful commute. I didn’t have a car at the time and had very little choice in my mode of transportation. I’ve now moved to Bristol for my wife’s work and boosted to 30 miles each way. There’s a great little cycling community at work and I keep meaning to join a club to try out racing. That’s why as soon as I saw the announcement that road.cc were hiring for a 24 hour challenge I was on it like a shot. In my mind we’re all going to qualify for RAAM next year. What I’m most excited about though is meeting a few members of the amazing road.cc community, putting faces to some of the hilarious comment section posts and sharing a cold brew with some new friends after a gruelling once-in-a-lifetime (well twice now) ride." Now Fiona is no stranger to flying around race circuits taking to Castle Combe pretty much every Tuesday evening and being part of the Cycle Surgery team who covered 138 laps and 335.7 miles around Brands Hatch last years revolve24. This year things haven't exactly gone to plan in the build up but with a fastest lap time of 9 mins 34 secs Fiona will be hunting a new PR for sure. "Unfortunately, six weeks ago, I was knocked off my bike by a car which has obliterated my confidence to venture back out on the roads, so this is a perfect opportunity to return and rekindle that buzz in a traffic free (by that I mean cars) environment, where I can focus solely on riding, it’s incredible." "My bike was damaged irreparably but the incident hasn’t affected my ability to ride though, so I’ve been a frequent flyer on a Tuesday night at Castle Combe, riding my cyclocross bike around the track on knobbly tyres. I’ve recently found a second-hand road bike which I’m very excited about trying out next time I visit. Unfortunately, unlike Brands Hatch, Castle Combe is pancake flat, so I’ll think I’ll need to supplement my training with some off-road riding on Salisbury Plain to maintain my strength on hills." "Last year I found Brands Hatch pretty daunting as it dips and flows with a huge range of cambers but as each lap passed instead of fear I was shaking with a real high from the excitement of being out there. Gradually I was using the brakes less on the descents, nailing the gear shifts and becoming quite efficient on the climbs, by the end of the event I was pedalling downhill, hunkering down, spinning up the other side, it got to the point I was overtaking stronger riders on the climbs and catching them on the start-finish straight – it was awesome!" "Our team pulled out all the stops and we went on to win our category. It was quite an experience in itself to regroup at the presentation and we got to climb onto the podium truck along with the other winners including Jason Penny to collect our winners’ prizes and bottles of bubbly! So I’m really looking forward to be returning again this year and to meeting my new teammates!" Another newcomer to the event is Tom who is a local lad with Brands Hatch practically in his back yard. "I’ve been cycling since 2011 and tend to focus on more endurance events than out and out racing – disciplines being road and increasingly cross (which I am useless at given the endurance nature of my training). I take training seriously and over the chilly months operate largely out of my pain-cave/indoor setup, driven more by the want to retain and improve fitness rather than beating anyone else (mainly because I would lose!)." 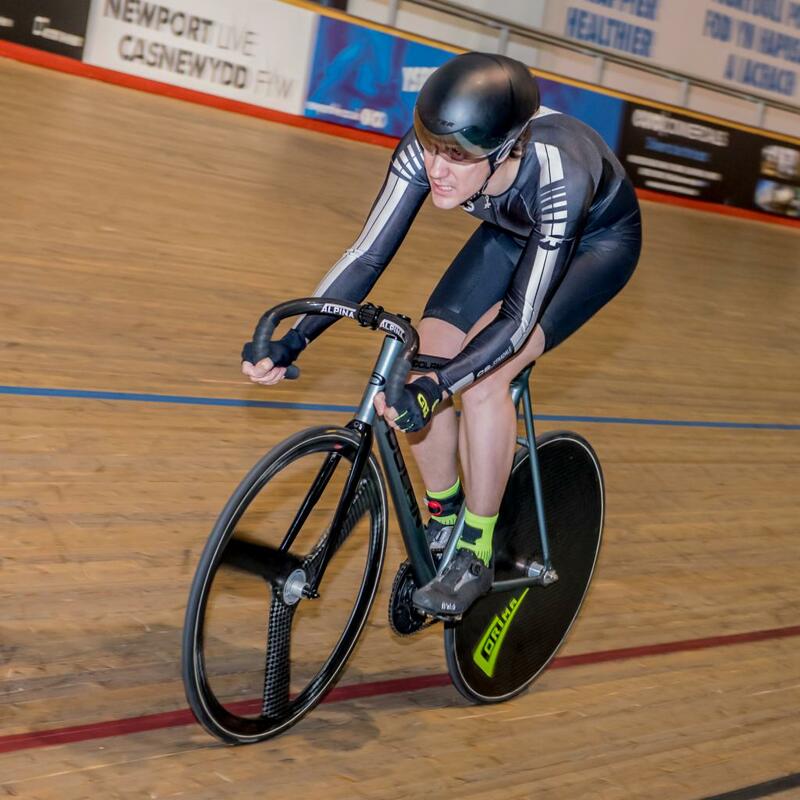 "Since breaking my back in May 2016 I have had a bit of an realisation that my chances at being the next Froome are long gone and so have become a BC accredited coach, hoping to live vicariously rather than through my own flailing ambitions! So why Revolve 24? Well reading about the previous race on road.cc a while back it sounded great, the atmosphere, the friendships and the semi-racing/endurance nature of it really appealed. With Brands Hatch being on my doorstep as well, I have always wanted to ride the circuit, what better way to do it than with road.cc, over 24 hours and at times in the dark. Right?" With two revolve24's under his belt and being part of the road.cc team at Cyclone24's Manchester Velodrome event there is nothing this guy doesn't know about sleeping rough on any spare piece of floor to be found. He's also done a bit of power meter testing and training for British Cycling so he knows his onions. He is also the owner of a four bar electric fire which in a freezing cold pit garage at 3am makes you a very popular bloke indeed. "I've ridden revolve24 the past two years and I will confirm that nothing can prepare you for quite how lumpy Brands Hatch is - especially the first hill. It's not very long but it's bloody steep especially when it's 3 am dark, cold and you have been going for 12 hours." "However whilst you may question your own sanity for volunteering for this you will love it and hopefully if the last two years are anything to go by you will meet some fantastic people and make some great friends." "So I am still wondering quite what possessed me to apply to take part in this year’s revolve24, I mean once is enough right? That is definitely my wife’s opinion. Let’s just say she is less than impressed with the thought that, as she sees it, once again I get to spend a weekend messing about with a number of other silly blokes riding around and around in circles in the middle of Kent." "In 2015 we had moved house the week before and last year we are about to enter week 5 of having our kitchen refurbished so maybe she has a point. I know that I have used up any sympathy she may have when I come in from a training ride complaining of lactate build up and not being able to climb the stairs." Jamie had his first taste of endurance riding at last years revolve24 and obviously was bitten by the bug as he is back for me, it's amazing how quickly those rose-tinted glasses slip down over your eyes. "Most sports people are competitive, however I find cyclists take it to a whole new level with discussions on Strava segments, power outputs, average MPH on a ride and of course how many miles you cover in a week!!!" "Plus, it is a race and who enters that without thoughts of overall victory or at the very least a podium finish?" We'll keep you up to date with the progress of the team and if you are taking part in revolve24 then make sure you come and say hi. Nowt wrong with riding solo, or "mental" as you call it. I enjoyed it so much, I'm doing it again! Le Mans the venue though, so much less lumpy than Brands Hatch. My write-up of the event from 2015 is here on road.cc (though most photos have evaporated...) if anyone wants to read a soloist's perspective. "plus this year we will actually have a team manager/brew maker/broom pusher who will be watching from the sidelines ​ going back to his nice comfy hotel, to make the choices​ sleep"
There, I fixed that for you!! Looking forward to it, we certainly have a formidable team. Liked the idea of this when recovering after being hospitalised by a taxi driver at the end of 2014. Would be well up for it in a team of 6 or 8. I've done 24hr karting and been to Le Mans (WEC) twice so I know how brutal this sort of thing can be. Good luck guys - give 'em hell !